I have a confession. I don’t like tea. And I don’t like coffee. But living in a city where cold, dark nights can take over half of the year, a hot drink is a must. My rescue is chai latte! A good chai latte lifts my day, revives my spirits and sends me out into the cold ready for whatever. Great chai is spicy, sweet, hot, milky not watery and leaves a pleasant aftertaste that teases the tongue. I have invested time and money discovering the best… and worst. Now I know this is where you’re waiting for the tip about the cool, independent cafe with funky staff and worldly music lulling me into comfort as I sip on sweet, scented hot delights. If you know such a place, let me know as I’ve yet to discover it. Quite simply for me there is only one contender. Starbucks on Bothwell Street. Now before you roll your eyes and turn up your nose, hear me out. Not all Starbucks are equal. So don’t turn up on Buchanan Street or Charing Cross and expect the same great knock-your-socks of service and chai perfection. Because, frankly it ain’t gonna happen. Bothwell Street with it’s friendly, savvy staff is tops. But the ultimate chai requires careful consideration and strict instruction (I’m lucky in that the lovely staff at Bothwell don’t know my name but do know my preferences – and so I don’t even have to run through the list each time). And if you want a full-bodied flavour sensation – ask for extra chai. This can be a tricky one and depends on the barista – because some are more generous with the chai then others. But you’ll figure it out. Lastly, enjoy that everything-is -right-with-the-world moment in your warm cup of frothy wonder. 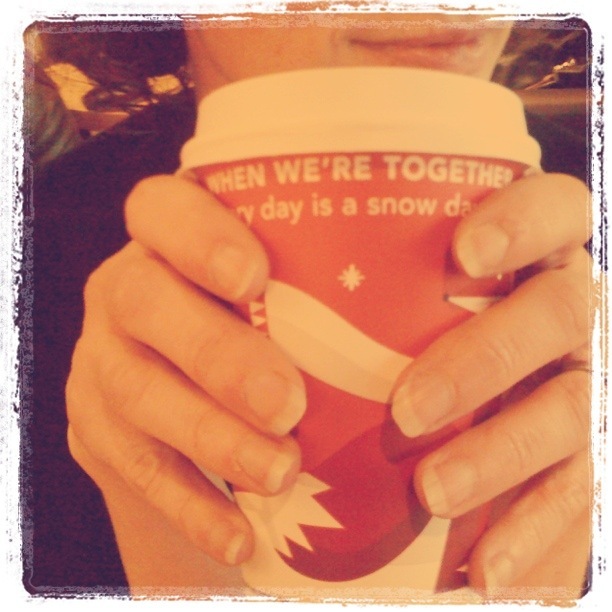 This entry was posted in Glasgow and tagged Chai, Chai latte, hot drinks. Bookmark the permalink.